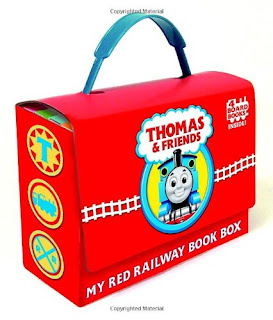 Right now you can get this Thomas and Friends: My Red Railway Book Box (Bright and Early Board Books) for ONLY $6.99 (Retail $14.99)! My son had this when he was younger and he LOVED it! He carried it around everywhere! Requested again and again, here, at last, is the Thomas Bright and Early Board Book Box Set. All four of the enormously popular Thomas board books are here: Go, Train, Go! ; Stop, Train, Stop! ; A Crack in the Track! ; and Blue Train, Green Train. Boxed together in a nifty little "lunchbox," these four books are a feast for Thomas' smallest fans. The box features a sturdy handle and a velcro close and is perfect for Thomas lovers on the go.